If you are looking for a holistic, quality Catholic education for your son, Trinity College in East Perth may be the school you are searching for. We strive to provide the highest level of teaching and learning in an environment that keeps expanding to meet the physical and emotional needs of all students. 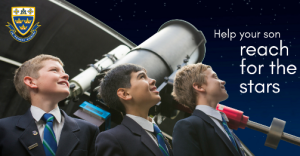 To learn more about the extensive things on offer such as our state-of-the-art robotic observatory or our Design and Technology centre using the latest equipment in technology laboratories, please visit our website for further information. Interviews are now taking place for Year 7 in 2018, with limited places available for Year 7 next year. Visit www.trinity.wa.edu.au or contact 9223 8121 to book a guided tour.